Next time you’re camping with your little kids, keep them busy with this fun camping activity! 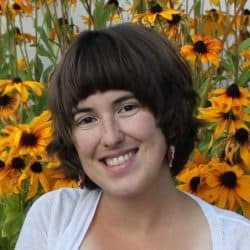 If you’re like me and enjoy camping with your little kids (or maybe you’re afraid of it!) then you know they sometimes get bored… and with boredom, comes whining. 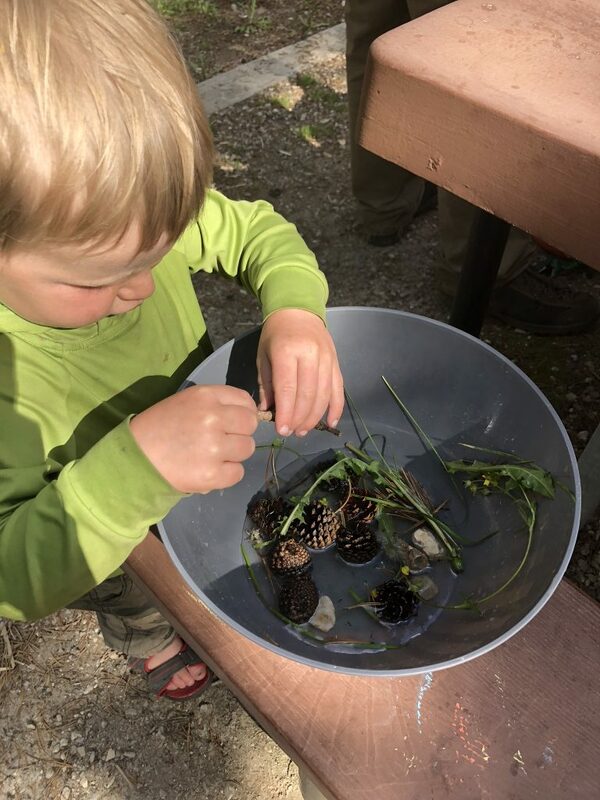 But I’ve found a GREAT way to keep toddlers busy around camp is to task them with something – in this case, a camp sensory soup for their favorite animal! Our toddler just turned 3, and he lives for campfires and throwing stuff in the water. If that isn’t available, such as when we are just hanging around camp, he gets antsy pretty darn quick! We discovered this fun activity by accident, but are so thankful we did! We were washing out our giant pancake bowl (it needs to be pretty big to make enough for 5 people!) and there was a little water left in it. Next thing you know, our toddler had started to put pinecones, flowers, you name it… and said it was Dino Soup! Currently, his favorite toy is a finger operated dino that opens and closes his mouth, which means that dino eats everything. It kind of gives me fond memories of my childhood! I used to attach clay to little skeletons and pretend my dinos were eating the “meat” off. A little, but I’m here to let you know I still turned out somewhat normal! While you can improvise on the spot, I like having these for guidance. Plus, if you laminate them, your toddler might enjoy being able to carry it around! You can download my recipe cards, or find a template elsewhere and use that! Another fun use if you have pinecones in your area is to make these easy firestarters! 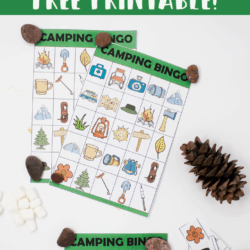 Here are the recipe cards for this fun camping activity! Even if you aren’t camping, you could use these around your yard to keep littles occupied and busy outside! A PDF version of the recipe cards is here for download! Step 2: Send your toddler out around camp to find everything they need! Give them a bucket, and send them out with their recipe card! You can adjust your recipe card however you want – IE, if you don’t have pinecones in your area, just ask them to get more rocks! Don’t forget to add water to the bucket! P.S. If you’re thinking of camping while doing this activity, check out how to make the experience even less stressful by finding a great campsite! Find out the 5 things to avoid for a kid friendly campground! 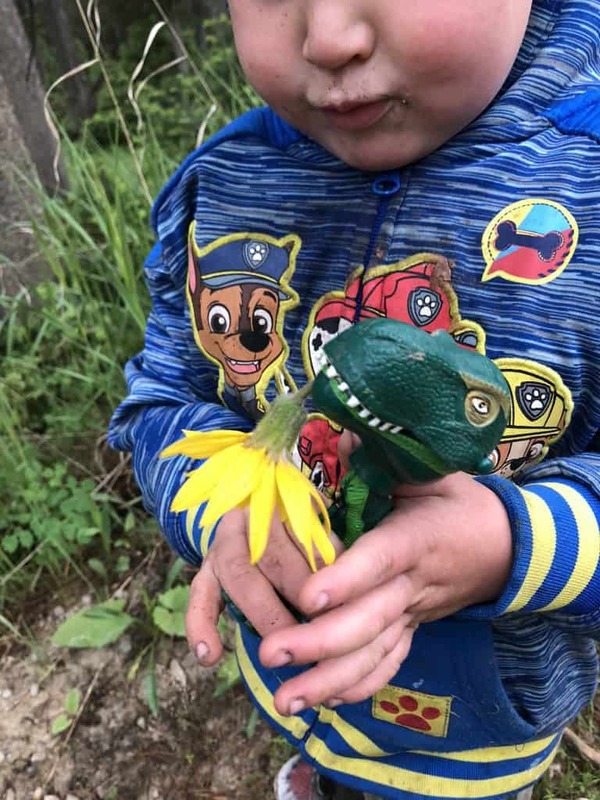 “Little Dino” often helps in the ingredient gathering process for his camp soup! Step 3: Make sure to count each item with them to add to the learning aspect! If you’re busy, it’s definitely ok to let them do their thing! 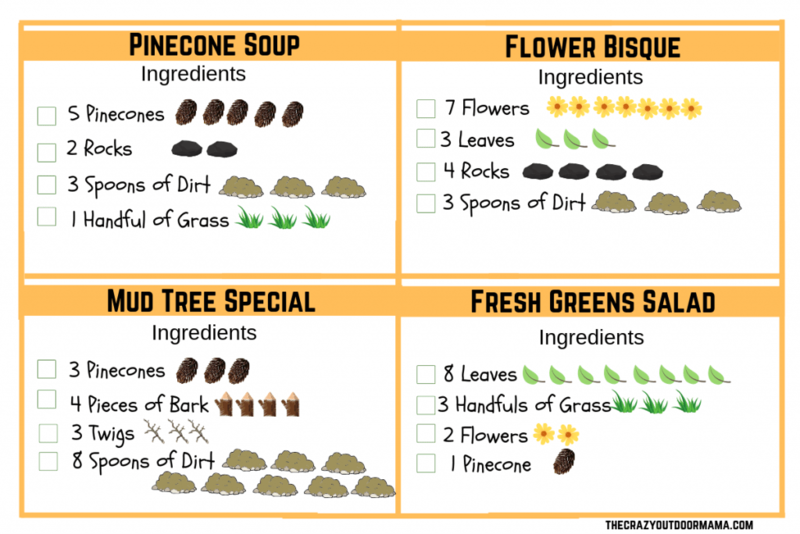 But if you have time, help your toddler count out each “ingredient” they found around camp! I honestly didn’t keep track of how much of each he put in this one. He was having way too much fun on his own! See who can gather all the items on the recipe card first! Add specifications to the materials needed – IE, only flat rocks, or only yellow flowers, etc.. Enjoy camp “cooking” with your kids, and let me know if you’d like a modification! I live in Wyoming, and so am only familiar with areas near me. If these things aren’t near you, I’d love to modify the “recipes” so that there is something for everyone! Here are some more camping and outdoors ideas you may be interested in! Want more ideas for bored toddlers and babies around camp? Check out these 11 hands off camp activity ideas! Do your kids like play doh? 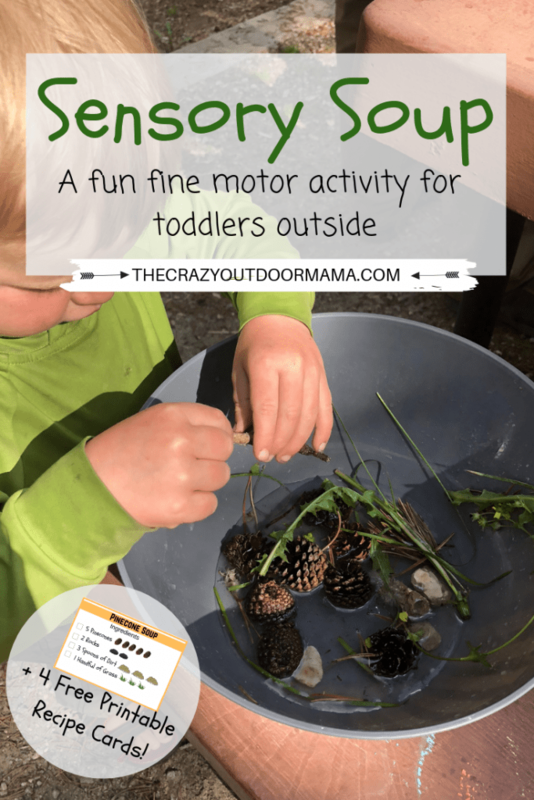 There are tons of opportunities to use play doh outside! 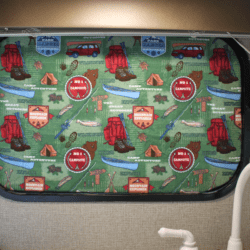 Want to do more crafts while you camp with the kids? Check out why (hint: TONS of developmental benefits) and what to carry in a craft bag! Make a campsite sign with your kids to mark your spot! If it’s your first campfire with your baby, remember it forever with this campfire handprint craft! Make your very own GLOWING campfire in your home with this fun and easy campfire craft! Learn how to make awesome s’mores anywhere! Did you know you can make them without an oven or microwave?? Perfect for little ones to occupy their time, fun with counting too! Funny story about Play-Doh , skeletons, and dinosaurs!!! Yes! It’s super helpful for that. LOL maybe my son will get into it as much as I was!